Any Asgard Haus condo for sale will have easy access to skiing and all the recreation and culture Breckenridge has to offer. 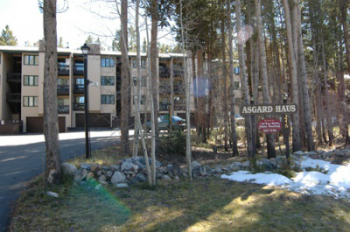 Located in a grove of pine trees just a half mile from the base of the Peak 9 ski area, Asgard Haus are convenient condos. While set in the family and vacation-friendly Warriors Mark neighborhood with a hiking trail out the backdoor, any home for sale in Asgard Haus is only a short walk to downtown Breckenridge. The name Asgard comes from old Norse myths and means one of the nine worlds, the one that contains the home of the god Odin, and the mythical, heaven-like place called Valhalla. The block-like multi-story building is made up of smaller condos that were designed as ski or summer second homes. They have big living room windows and sliding door onto a small balcony, which faces the ski slopes. They have no garage but underground parking, and additional surface parking. Start your search with the Asgard Haus condominium listings found below, or read more about recreational opportunities near Asgard Haus. 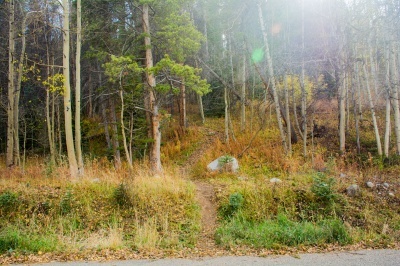 The trail out the backdoor connects this area to trails that continue into the national forest, and Broken Lance Drive - out the front - is just one half mile from the southern end of downtown Breckenridge, so everything in town is a short drive or bike ride, and access to these homes is easy for those coming from the south. Fishing the Blue River in the Warriors Mark open space is a privilege reserved for neighborhood residents and is home to a healthy population of cutthroat and brook trout. Size: 573 to 816 sq. ft. Amenities: on shuttle, near Peak 9, hiking trail outside, view to Ten Mine Range, forested, walking distance to town, in-town boundary. From the southern most stoplight in Breckenridge, at Boreas Pass Road, take a right and head west on Broken Lance Drive. Follow this drive as it curves left for one half mile and you’ll find a sign for Asgard Haus on the left and a large parking area. Don't hesitate to contact us if you have any questions about Asgard Haus condos, or any other Summit County real estate area.